982206 is rated 5.0 out of 5 by 1. Rated 5 out of 5 by Misfit Kevin from Nice product It's an AN fitting. It fits. It fit's nicely. I put some stank on it when I was tightening it and the wrench didn't gnaw on it like Mr. Ed's teeth. It's blue. It's pretty blue. 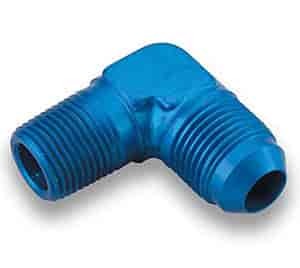 If you like pretty blue AN fittings that fit nicely and don't look like a hacked up nub when you're done, these are the ones for you. Oh, and they're the cheaper option so you can save some duckets, too.